baby snuggles - two weeks ago, molly o joined the o'regan clan of catford, and on sunday i finally got to have my baby snuggles with her. she is so tiny and small and delicate, just like a little china doll; i was obviously too terrified to hold her, but instead sat next to her and stared at her while i stroked her tiny foot, willing her to wake up. she never did. torture. catch ups and 'chilladas - on tuesday i had my quarterly catch up with poppunkmark, and we did it in style by eating too much at wahaca then drinking too much at bourne and hollingsworth. i remember the night ending with mark jumping on the northern line going north, only to get a text the next day saying "why on earth did i get on that tube? i can't get home on the northern line." legend. any night that starts with pork pibil and ends with bourne again cocktails is pretty much a winner in my book. 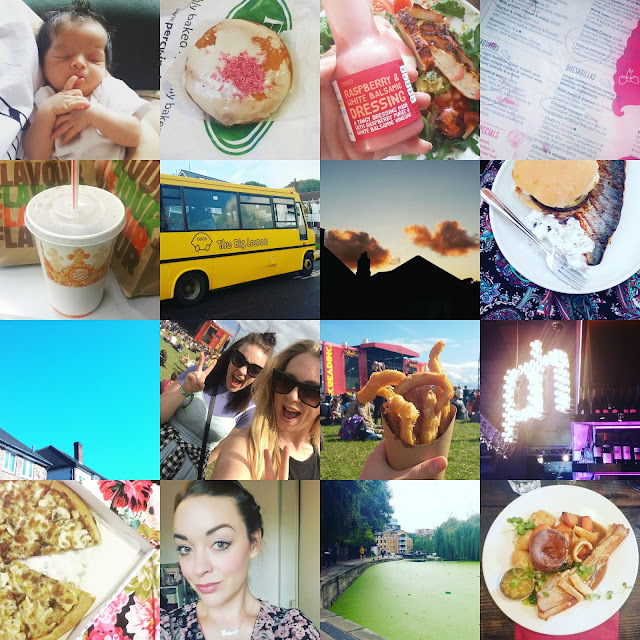 burgers, brighton, and a big yellow bus - we at talented talkers decided we'd celebrate national burger day last thursday in style, and so we played hosts to the best blogger meat up brighton had ever seen! with back yard games, flowing drinks, and a big yellow bus (apparently it's a brighton legend), we hosted thirty-odd bloggers in a gorgeous house with a lush backyard, fervently praying for the rain to stay at bay. turns out it did... mostly! it was a laaaaate night, but one that had me grinning from ear to ear the entire time. reading, baby! in late on thursday, up early on friday, knackered and sleepy, but excited to be reading bound! it was an awesome day, and the sun even blessed us with almost an entire days appearance. seeing some of my favourite bands - some 15 years in the making - was an absolute highlight; singing along to hits from my formative years was such an awesome feeling, and one i won't forget any time soon. a comfortable end - falling in to a massive king size bed after a day of dodging mud was absolutely amazing. the 10am fire alarm was not. x factor! omg! my life! is gone again! until christmas! saturday night's show had me in tears, and the whatsapp group chats had me in fits of laughter. then sunday night's show completely destroyed me - seeing uncle simon cry like that over that young lad was just... awful. we've seen some really great singers already this year, and it's awesome having olly and cazza back together again! i do miss derm, but with rochelle and marvin on xtra as well, i am completely in love with the new x factor fam. bring on the best season yet! compliments for no reason - i posted a selfie on sunday that had some really laaaaavly comments on it in no time. i know that's kind of the reason we post selfies, but even the biggest narcissist doesn't expect that kind of reaction. it gave me all the warm fuzzies while i was out and about lunching with my girls, so thank you for the ego boost you lovely lot. that's been my week of happy things, now tell me all about yours?